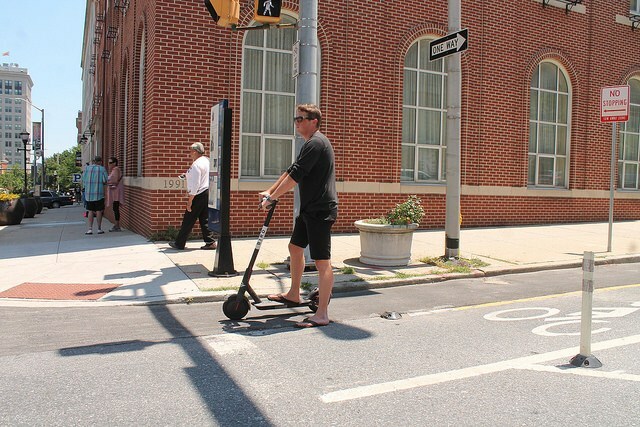 Rarely has a new mobility device generated more enthusiasm, and simultaneous resentment, as did the e-scooter. Not only are they the latest fad on the mobility front, but they represent a genuine opportunity to unclog car congestion. For e-scooters to succeed, they have to drastically increase their ride share and get cars off the road. The space for their safe operation must come from the street space that is currently way too generously given to cars. 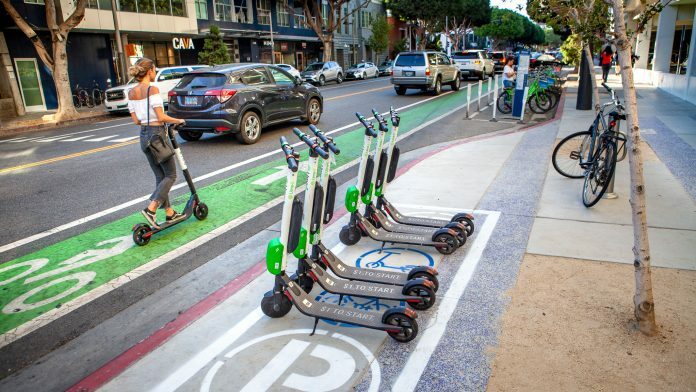 Cities quickly “overrun” with scooters, like Santa Monica, or San Francisco, have gone to sometimes-drastic measures to regulate their use. Several L.A. County cities have banned them all together. E-scooters seriously upset the carefully parceled out status quo of who gets to use how much of the public realm, and a fierce scooter counter movement sees in them nothing but a further threat to the established land-use conveniences in the city. Properly used in a mosaic of mobility options, e-scooters can pull an ever-escalating car congestion crisis back from the proverbial breaking point, and provide space and time to implement overdue structural changes to the urban fabric in the long term. It is best to start with an accounting of who specifically uses how much of this public space. The primary issue is that cars are simply using too much – a reality successfully ignored for about a century now. However, that is slowly changing. E-scooters are narrow and nimble. They let people find surplus street space to move again, which is why these companies have grown so explosively. Practically, scooters are part of a new mobility category called ‘micro-mobility’ or, more simply, ‘little vehicles.’ Bicycles also belong in this group; as well as miscellaneous individual motorized products with which several companies are trying to secure their role in future cities’ transportation infrastructure. Little vehicles (LVs) use space in tiny bite-size chunks per person transported, and they can thus relax congestion by allowing more people to move in the same amount of space. Every person on an LV – instead of in a car – frees up space for the remaining cars. Drivers, more than anybody else, should celebrate scooters. To date, drivers have not shown the love. The reasons for this are simple – little vehicles have no dedicated space on our streets. They are thus left with a choice to either ride in car lanes (where they are in the way of automotive traffic), or ride on a sidewalk – a space so marginalized in L.A. that a lonely pedestrian combined with a single little vehicle often exceed the entire sidewalk’s mobility capacity. The space requirements for cars vs. LVs are easy to compare for parked vehicles. Where there are scooter corrals, for example in Santa Monica, tens of scooters can be parked in the space normally given to a single car. But the space consumption is further exacerbated for moving vehicles. According to the National Safety Council, moving vehicles should be separated by the space required to travel for three seconds. This makes one car traveling at 15 mph require as much space as do 7-8 scooters at the same speed. In theory, one only needs to dedicate enough safe street space for little vehicles, then get as many people as possible to ride them – and traffic will flow again. Contemplating a purely hypothetical example, one could assume the creation of a ‘super-grid’ over L.A.’s street grid (inspired by the one being tried in Barcelona), where on every fourth street two of the typically four lanes are converted to protected lanes for little vehicle traffic only. Such a design change would – in essence – allow 12.5 percent more vehicles to use the streets – albeit not all of them cars. The fact that meaningful safe bike infrastructure can help overall traffic flow again has recently been proven in Toronto. While there is rarely neither enough money nor political will in Southern California to build it, this equation could change with bikes and LVs forming a more powerful lobby to demand a protected LV infrastructure for all. The question is whether enough people could be convinced to make the switch to LVs. Safety and security are imperative to entice people to ride ‘little vehicles’ instead of driving multi-ton motorized behemoths. L.A. streets right now feel anything but safe. They are a quasi-battlefield where he/she who has the biggest vehicle is safest, and feels the boldest. The absence of safe space to ride has contributed to a nationwide decline in bike riders, and the lack of safe road space in Southern California has a lot to do with why this is happening. Additionally, LVs also need to be separated from each other. Electrically assisted vehicles such as e-bikes and scooters can move – with little effort – more quickly than human-powered riders. This suggests two different lanes for LVs at different speeds. LVs need to be easily available close to trip starting points. In a competitive market, scooter companies will make sure that will be the case. But having LVs close by also requires attention in the public space. Streets need to be redesigned so that these vehicles can be safely stored without interfering with other people’s room to move. Angelenos need to challenge the assumption that trips happen in a single vehicle, start to end. Commuting distances in Southern California are long, and it is makes no sense that little vehicles provide point to point mobility, when these ends are indeed many miles apart. An integrated and hierarchical transit net offers a variety of mobility options at different levels of capacity and speed. For instance, a longer trip could start near one’s home on an LV, for less than a mile to a medium capacity transit vehicle, like a neighborhood bus. This bus, in turn, then collects other people and drops all off at a subway or light rail or commuter rail station. The train then whisks riders the majority of the trip distance. At the other end, one would use similarly hierarchical transportation options in reverse. All those different transit options need to work together and be reliable. Nowhere should one need to wait more than a handful of minutes for the connecting ride to arrive. Stations and stops should be close together, to allow walking from one to the other. There should be clearly visible, clean, and safe storage lots for the little vehicles of choice. It is obvious that L.A.’s transit system does not “yet” work this way, but this integration must be prioritized. With higher transit ridership, the next challenge then will be to relieve overcrowded trains and buses. There are solutions for this in the form of shorter headways for trains, and dedicated drive lanes for buses making them faster than individual cars on the road. Boston is running several pilot projects right now to do just that, and L.A. could do so as well. Redesigning streets for little vehicles will create temporary room to move for all, but this city has structural problems it must solve long-term. L.A. is already building public transit, but the city does not work well with it. Ideally, public transit is “fed” not by individual vehicles, but by pedestrians. From experience, people will not walk further than a half-mile to a station. Little vehicles can help extend this distance to a few miles. Still, the emerging new Los Angeles must concentrate development in compact walkable neighborhoods around transit nodes. This is happening already. 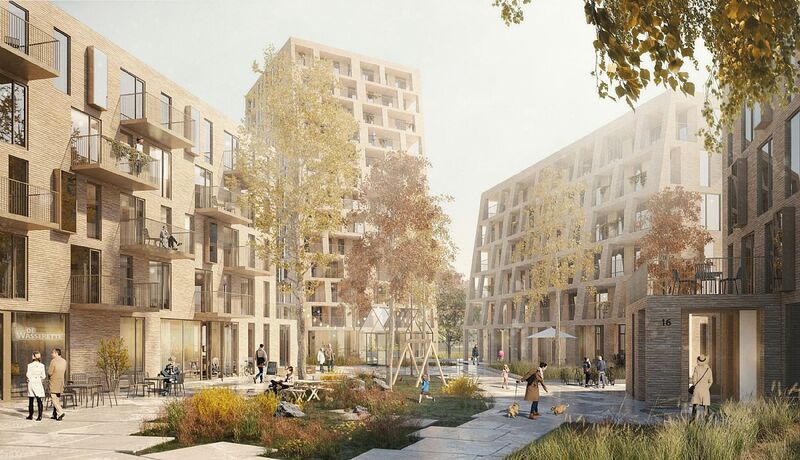 New residential developments overseas no longer envision cars in the public realm. Rather, they portray the ground plane as one dominated by pedestrians who have easy access to transit, sometimes with the help of LVs. This is not to suggest that cars do not exist at all – but they do not shape the urban space as much as local regulations regularly allow them to. According to the UN predictions on climate change, there is only a limited window of time to change local car-dependent habits in very profound ways. As the state of California found, in spite of all efforts to convert California’s power infrastructure to non-coal based energy, the state is not making nearly enough progress reducing the use of cars. In a discussion about big solutions to climate change, achieving walkability is still the most important long-term goal. LVs can help by getting people out of their cars short-term, thereby de-escalating congestion and, in turn, diffusing the many re-zoning battles about increased density. LVs can be the catalyst for L.A. to transform its urban fabric to be more compact, walkable, and transit-oriented. Indeed, Angelenos’ lives may depend on this. Gerhard W. Mayer is a local architect and urban designer. He leads the Los Angeles office of GGLO, a large multifamily design firm headquartered in Seattle. Extra benefit; no need to segregate or build new infrastructure for SNTVs, and parked perpendicularly to the curb eliminates bike dooring. Next week, LADOT will be sending cease-and-desist orders to e-scooter and dockless bike-share operators.